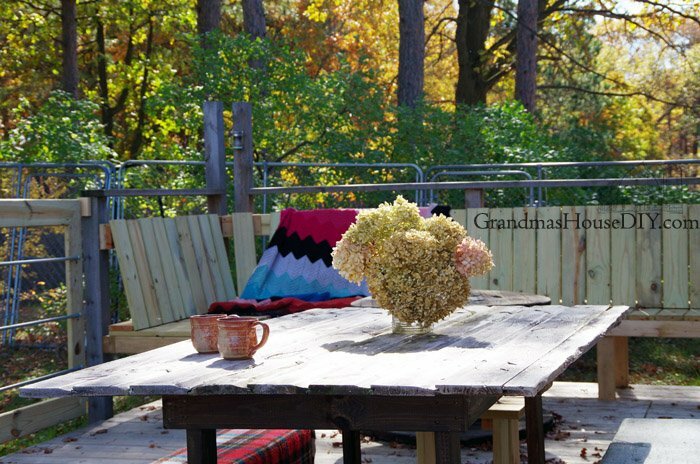 Home Tour: The deck, my outside dance floor and living room! 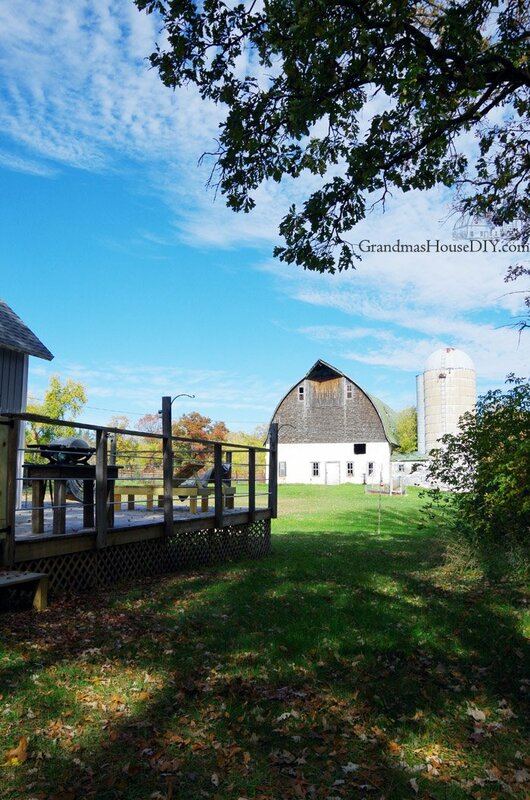 A post all about one of my favorite “rooms” of my house: the outside deck and my dance floor! When my grandparents’ lived here this was their least utilized outside of the home – the only way to reach it was to walk all the way around the house! 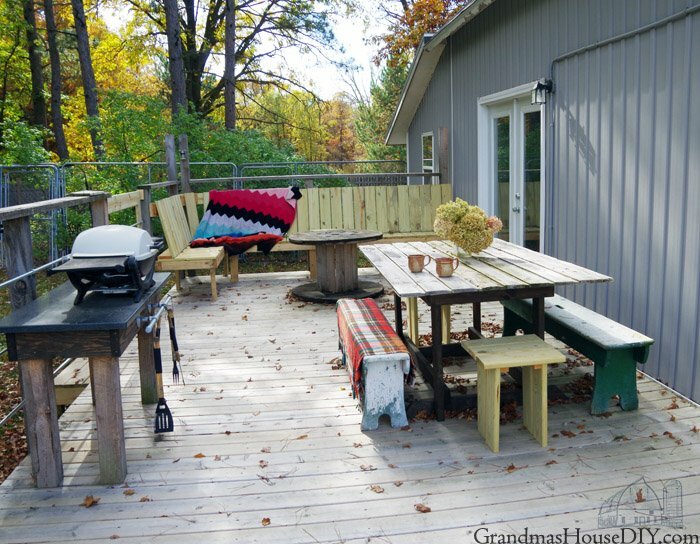 My plan to add this deck came naturally and was one of the first things I was certain I wanted to add and my ex husband and I built our deck together. I put in almost every joist hanger (all 8 million of them…) my ex dug almost every 4×4 post and we dropped the joists in together. 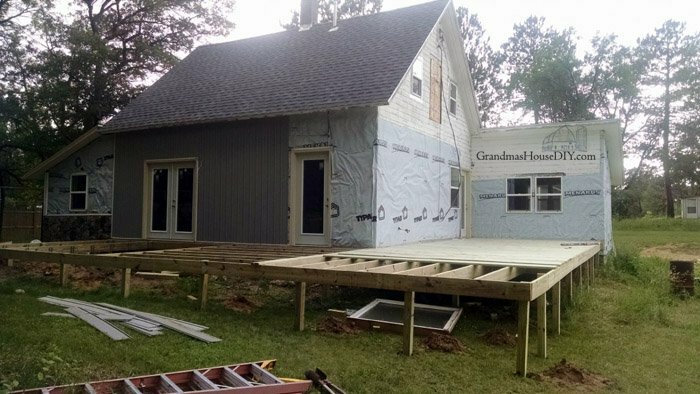 From there he took it over and laid down every last deck board over the course of three days. 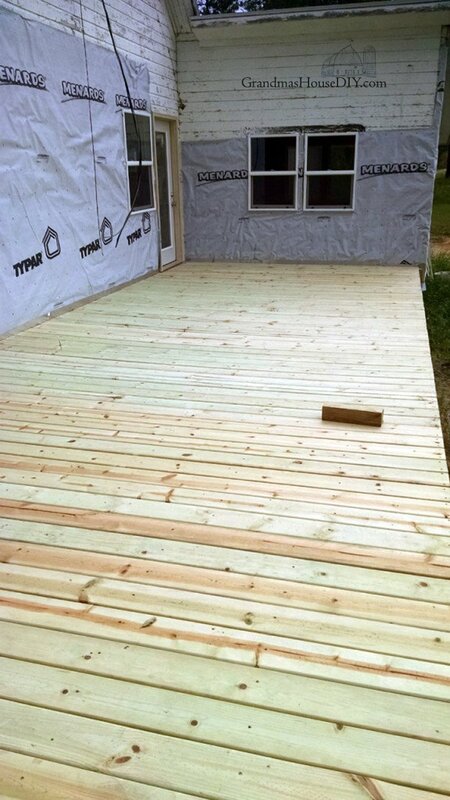 With the depth of the deck 11 feet all the way around I chose to use 12 foot green treated deck boards that we put in as tight as we could together and then cut off along the edge with a skill saw. 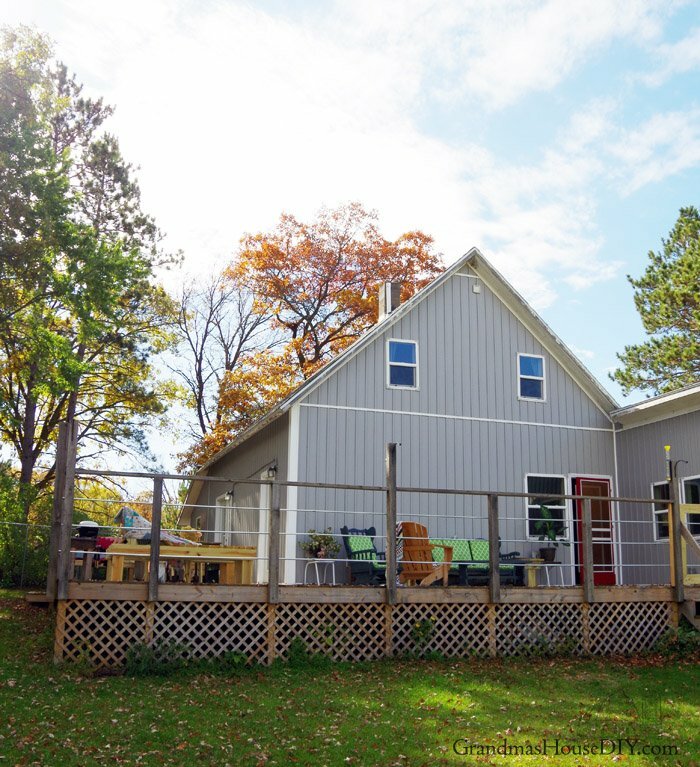 I always dreamed of a home that was never more then a few steps to outside, that I could flow in and out of my kitchen and my living room from my deck like they were all just part of the home. I am VERY excited to say that I managed it! I have three glass exterior doors that come out to this deck, one on either end of my kitchen and a 72 inch glass door in my living room. Did everyone think I was nuts to add this many doors? Of yeah but I haven’t regretted it for a second! 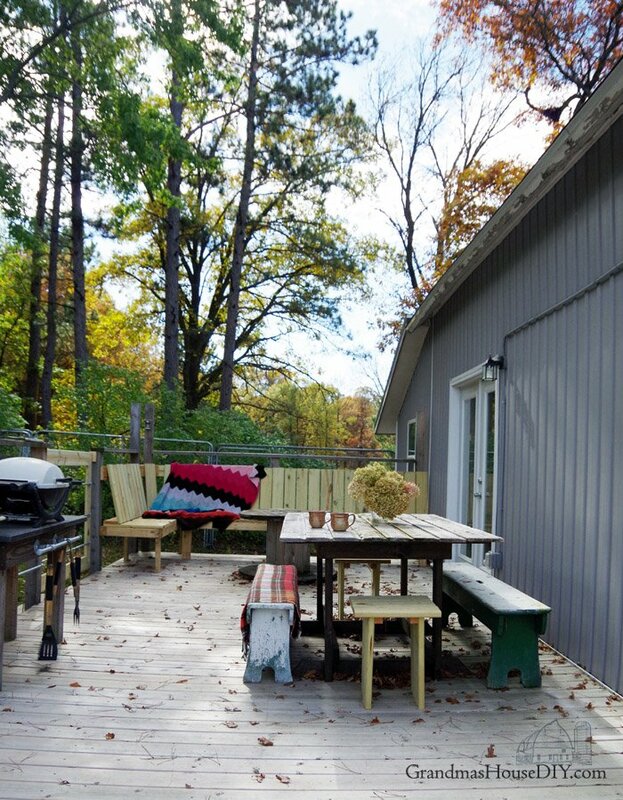 I love that I can open up all three of my deck doors and my home literally gets 700 square feet of living space added to it! 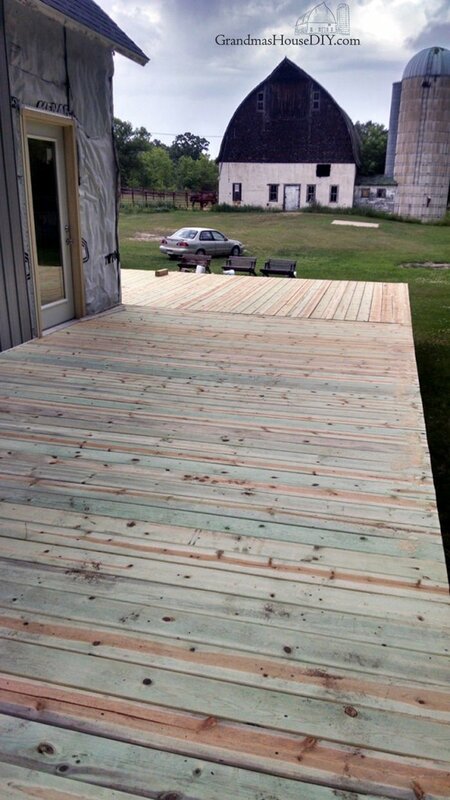 I chose green treated lumber because it was affordable and very very durable. 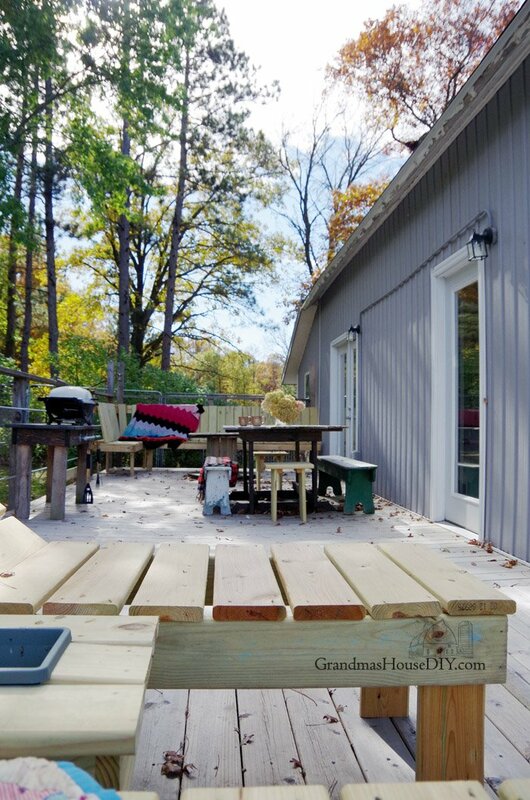 I always planned to finish the entire deck as well as my privacy fence in a red wood stain/sealant but I’ve decided that I’m not going to be doing any of that. Why? 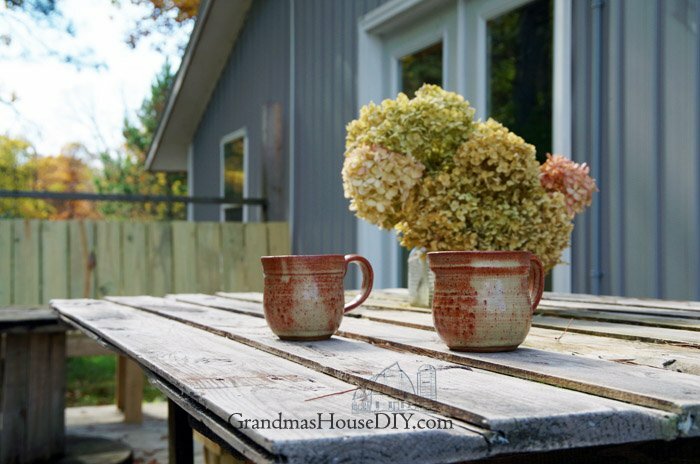 Because I live in northern Minnesota and I have known many people who spent A LOT of money (not to mention time) on exterior stains, sealants and finishes on their decks to see it not even last one winter. It is a certainty that, in my climate, it will fail (even in a very mild climate most outdoor finishes can’t guarantee any durability past 5 years anyway.) 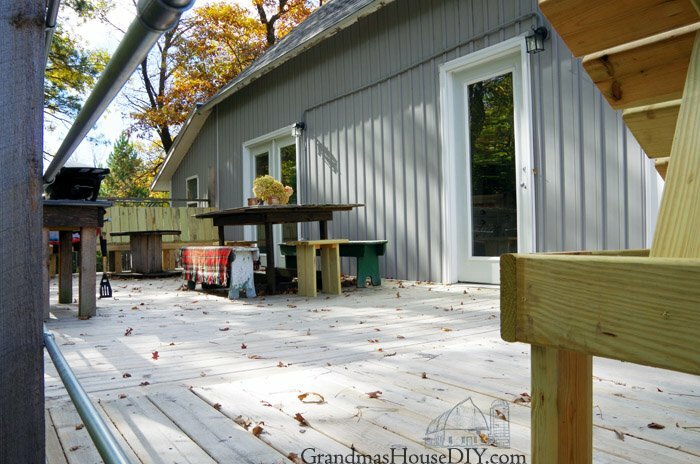 SO, this is it, I’m going to let my deck and privacy fence fade naturally to gray. 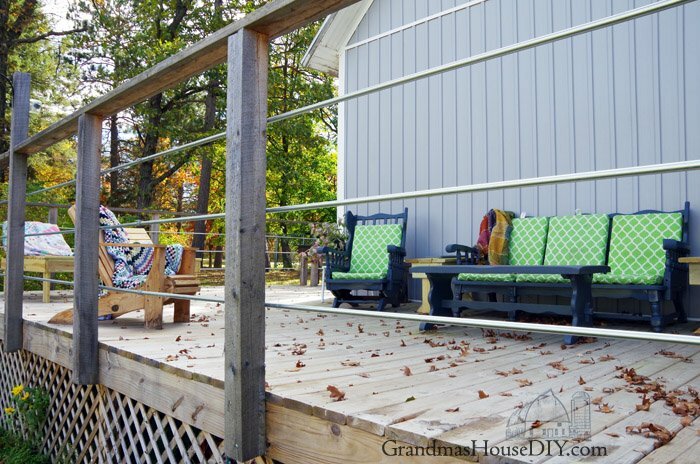 My last posts you guys saw was how I finally finished my deck rails and gates! And that’s really what’s been holding me up when it comes to sharing my deck here on the blog. 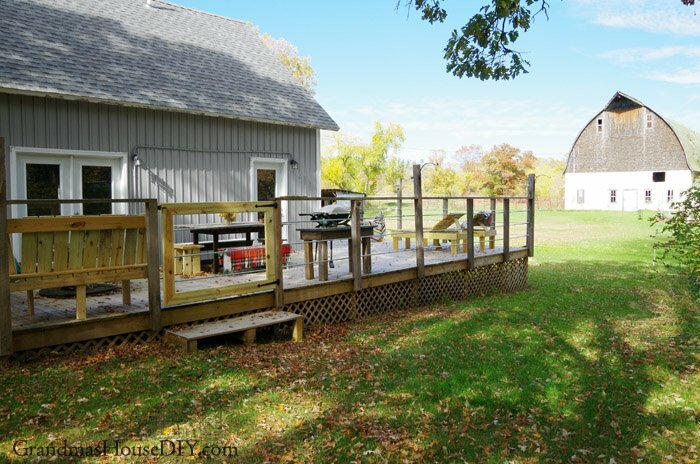 I just couldn’t make up my mind and because I didn’t NEED deck rails it got put on the back burner. Go and check out how I did the “rails” by clicking here and how I built the gates by going here. 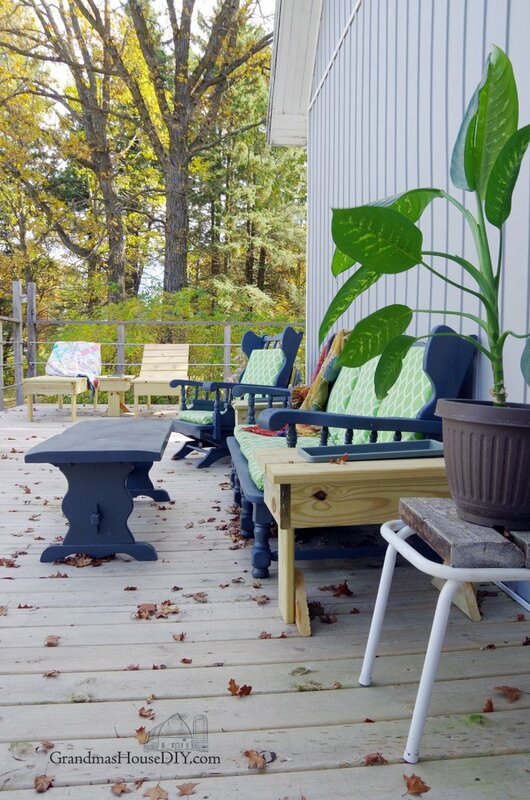 My indoor to outdoor furniture held up through two summers and two winters and that’s with the temperature going from 100+ degrees Fahrenheit in the summers and downwards of nearly -40 degrees in the winters. It is no longer perfect (if you look close you can tell) and I have basically swore off paint for outdoor furniture from this point on. And, though I love both the sofa and the chair, I also have one big complaint about them: they’re really low! I am playing around with the idea of adding to the sofa and chair somehow so A: I wouldn’t actually need the cushions and B: to make the seats higher and C: to add some cohesion between the end tables I built and the furniture because, right now, they’re from two different universes. My adorable little solar light jars that I made last year are still holding up and working great! This is a HUGE space (700 square feet!) 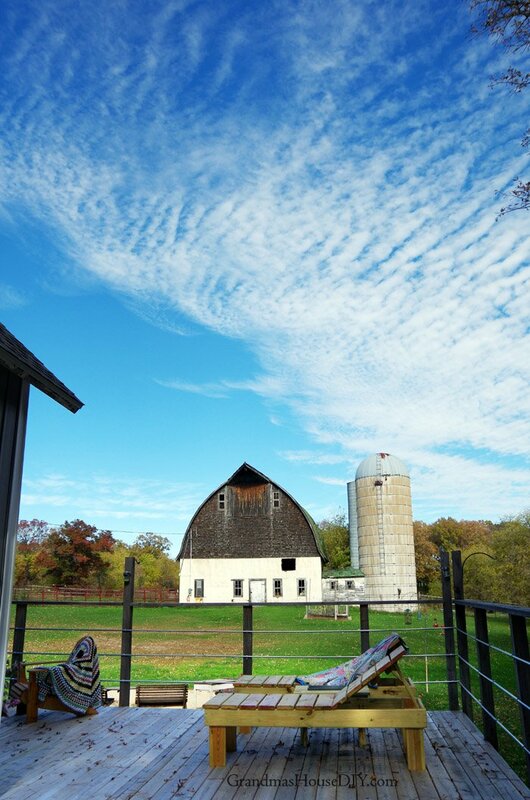 and my dream someday is to add outdoor string lights around the whole thing. The bench I built a few weeks ago dealt with the “dead-zone” I never used in the back and the sun loungers have given me a wonderful spot to just soak up the heat. Many people have commented on the height of my railing because it is REALLY high: 4 feet! When I was adding them I made this choice intentionally. 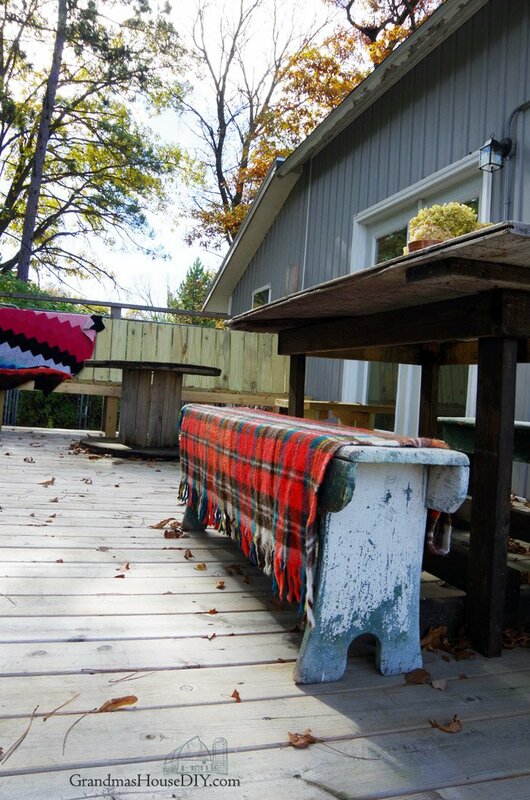 I wanted to be able to step up to it, lay my arms on it and have a nice high safe surface to put a drink. (My last dog was a 120 pound mastiff and I always plan on having huge dogs so a tall railing makes a lot of sense for me…) I like them this high but they’re certainly not for everyone. I finished up the base for my barn door table this summer and I am SO glad I finally got it done, I used it all the time! One day I will replace my little grill with a full size one and that will free up my grill station with a granite top to be a buffet right by the table. At first (if you check out my post about it) the table I had placed in a different spot but it needed to be close to where the food will be and its so handy having it two steps from the kitchen door. An addition that I simply did not get done was painting the other exterior doors black and adding the last screen doors this summer. 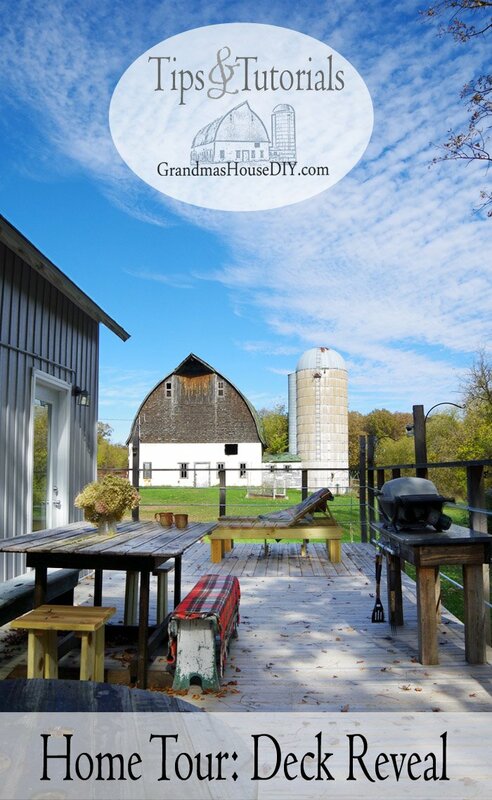 I finished one of them last year but I will have to buy the other screen doors or build them – so they are definitely on the top of my list for next spring. 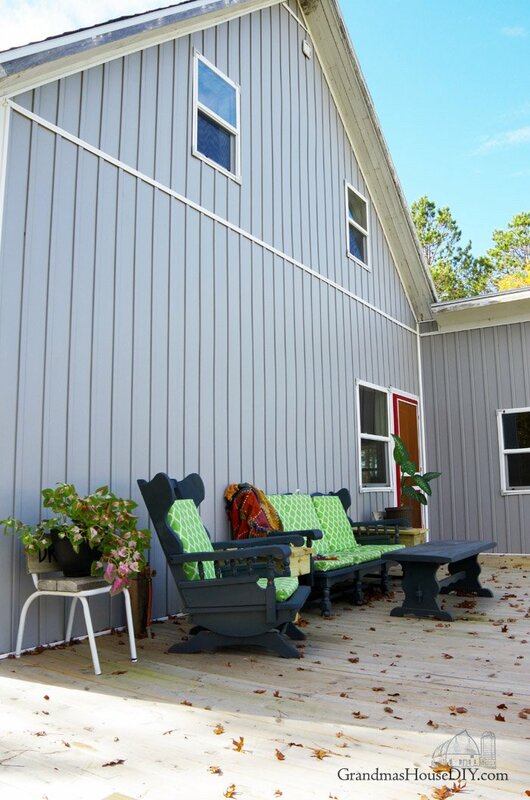 A project I have planned for WAY down the road is adding a little screened in porch out here too. It will encompass the kitchen window and door on the north side and complete the roof line into an A. There are still many things I can’t wait to do out here but I’ve had to really just hack away at it a little bit at a time. Even when you do things yourself, with a space this big, I’ve really had to scrimp and save for every project! 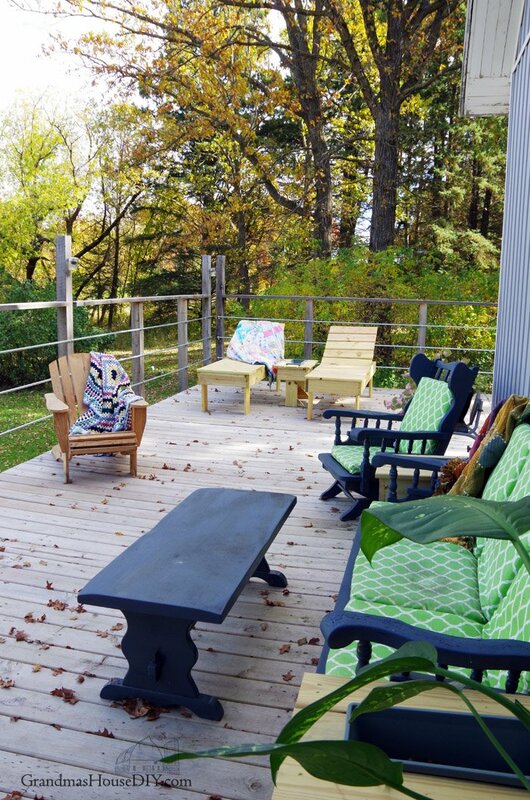 Your deck looks amazing!! I love how cozy and inviting it looks. Thanks for sharing the details! Thank you so much Diana! Have a great Thanksgiving! 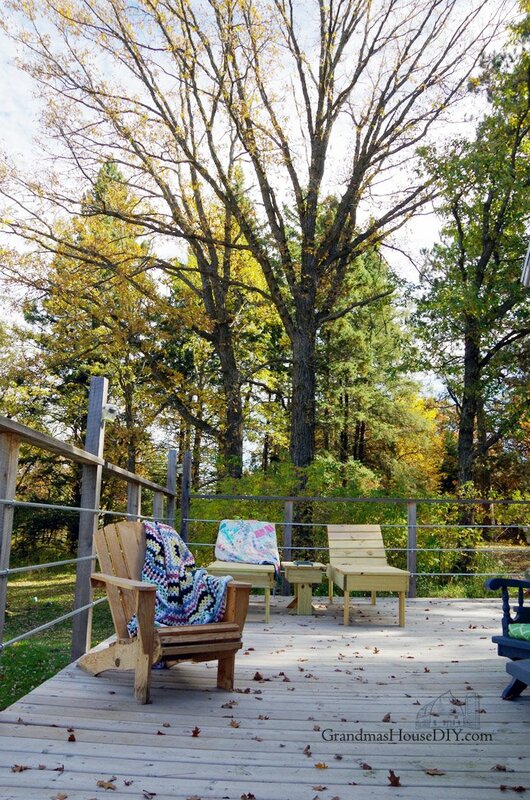 Great job on the deck and amazing views. 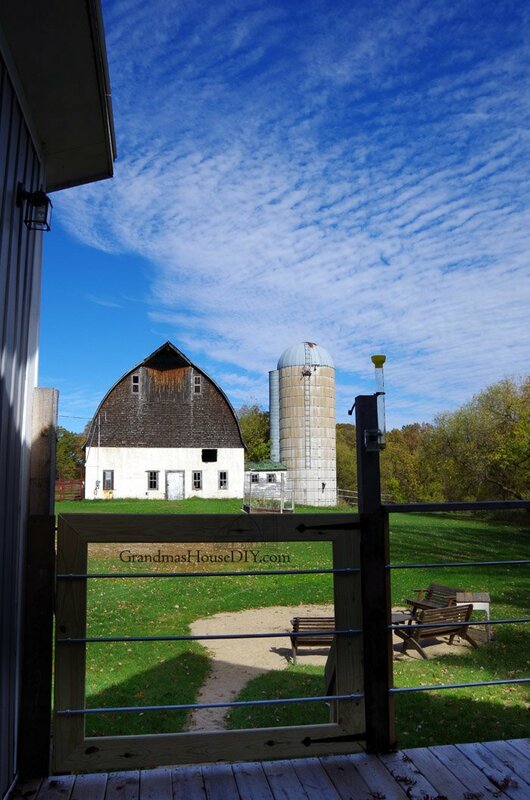 I love your barn. So sweet that you were able to be married at your Grandma’s home. Have a great week! It really is an amazing project and I love how it turned out! Thanks for sharing with SYC. Beautifully done and your view is amazing! 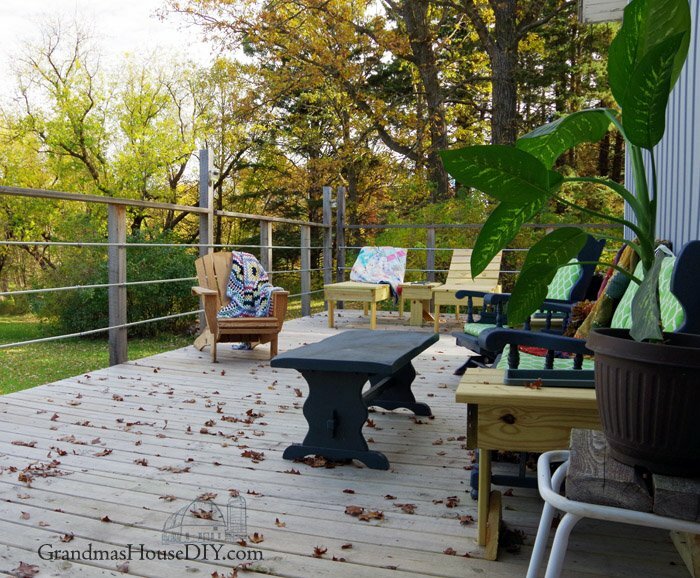 Amazing deck/porch and fixings. 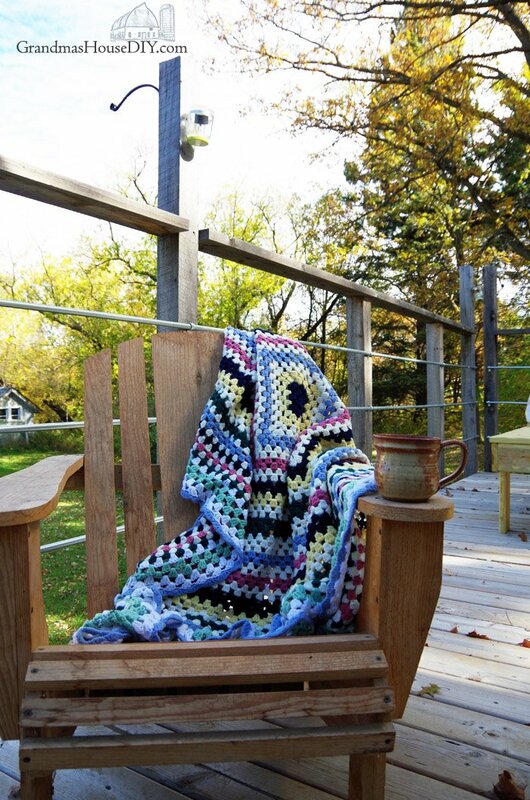 This is my one regret at my current home, no outdoor living space that isn’t grassy..oh well. About the height of the sofa/chair…I’m sure as creative as you are that you will come up with a solution for extending those legs–which is what I would do. 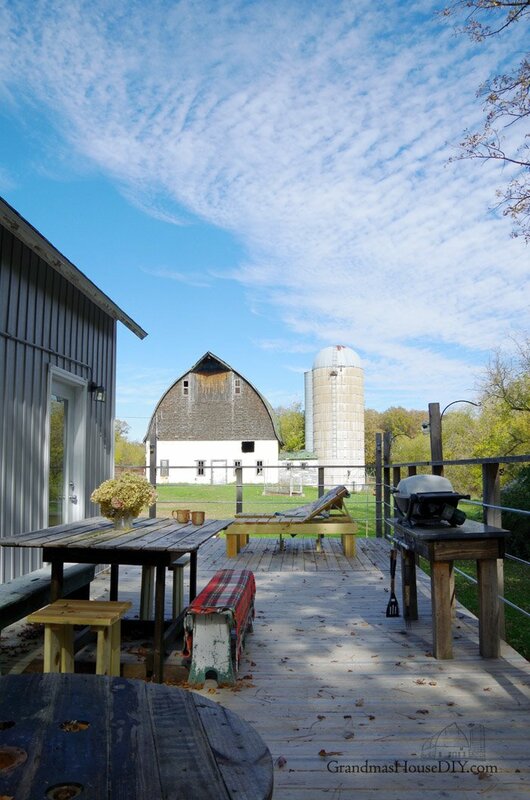 Thank you so much Laura, it was bucket list material lol I always wanted a big outdoor living space, can’t wait for this summer! Awesome project, detailed work completed with amazing and outstanding results it’s really impressive.